The new Legend of Zelda was little more than a teaser video at E3 2015. From there on up to this year’s show, little was talked about it outside of tentative release dates and whether or not it would be seeing it on whatever Nintendo’s console is going to end up being. 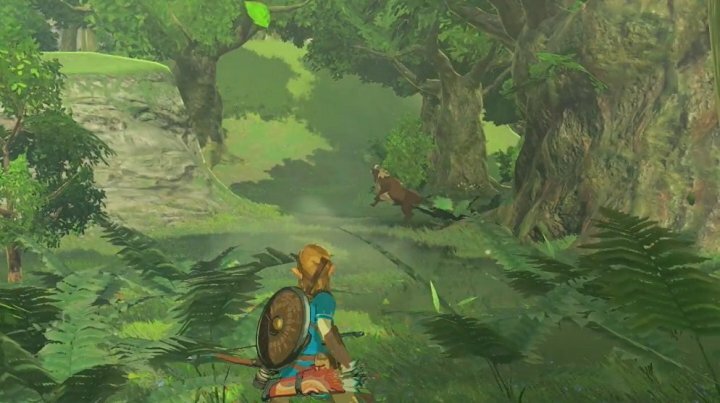 Our demo with the now subtitled The Legend of Zelda: Breath of the Wild lasted around 45 minutes, which were split between two slices of gameplay, starting with a look at a smaller chunk of the world and a few marked locations, such as treasure chests and temples. The striking first impression that Breath of the Wild makes is just how similar it felt to the very first game to me. Set in an open world, Breath of Wild is chock full of exploration possibilities, giving you little in the way of pointing in the right direction. The demo showed us a side of Zelda that hasn’t been seen in a long while, the notion of letting you go do your thing, on your own, at your pace. And that I did, while guiding a poorly armed and clothed Link through the gorgeous and lush world of Hyrule, catching a glimpse of Death Mountain and the sea in the distance before reaching frozen wastes, a moblin camp and the first instances of combat, and the new gameplay mechanics tied to hunting and resource gathering. While some scoffed at the notion of a Zelda game borrowing elements from open world games like Skyrim and The Witcher 3, it’s certainly worth praising Nintendo and director Aonuma for finally stepping outside the box with this one, willing to try something new. The result looks to be just what the series needed, and it makes me all the more excited to jump back in, after the disappointing and overbearing Skyward Sword back on the Wii. Hunting is paramount for gathering ingredients for Link to cook food and maintain his strength, which gradually goes down throughout the game. He also stocks secondary items that help him make new tools, an aspect that I failed to explore during my time in the demo. But aside from meat, Link can also acquire sustenance by climbing trees and picking fruits. But killing isn’t as easy as shooting and arrow straight and through an animal. Approaching one haphazardly will only scare it away, forcing you to be stealthy in how you approach. The amount of noise Link makes is represented by an on screen meter that displays a shockwave of sound with each of Link’s movement. Next to it, down at the corner of the screen, there’s also a thermometer, which brings up another element of this new game that has always been a part of the series, but that is seeing revision in Breath of the Wild: Link’s garments. As I approached the colder region of the demo map, he began shivering and losing stamina, prompting me to use a conveniently placed winter coat from the inventory. But outside of direct needs like this, there are a host of visually diverse pieces of clothing for him to wear, limited to the normal set all the screenshots of this early version show, as well as the more elaborate coat I mentioned before. But let’s go back to speaking of climbing. That was also something pretty cool in the demo. Link can climb all kinds of surfaces in the world by jumping onto them. Nearly all vertical walls are no obstacle to him, as long as he can catch his breath and regain the grip meter on his way, similarly to Shadow of the Colossus‘ wanderer. There was another element that felt borrowed or certainly inspired by Team ICO’s brilliant game from 2005 in the form of using your line of sight as means of reaching an objective, while not directly pointing you anywhere. 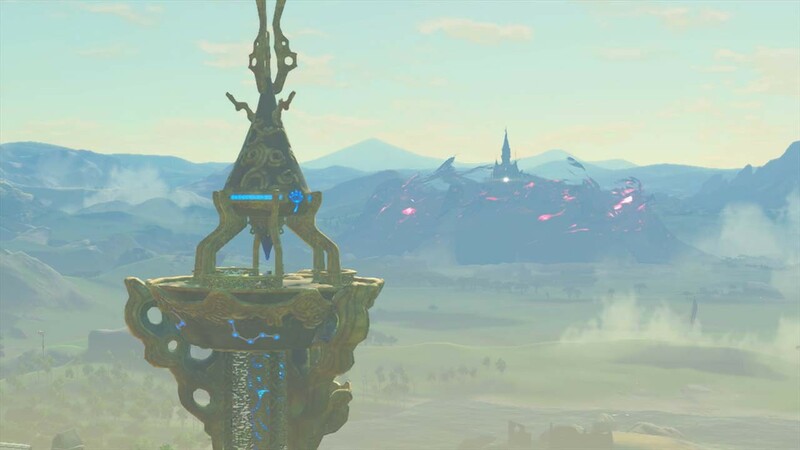 Frankly, there’s still so much to the game that I haven’t really grasped yet, even with the longer than usual demo, so throwing comparisons out is the easiest means of conveying and providing a frame of reference, even though I could already feel that this new Zelda is well beyond being simply derivative. It’s obvious that Nintendo is aiming for this to be the bold new direction the franchise is moving on to, even if it at its core this is still a Zelda game. That much was evident in how the second portion of the demo showed us the very beginning of the game, with Link seemingly waking up from slumber, called out by a mysterious (and fully voiced) entity. Practically naked and unarmed, Link wanders the dark cave like den he wakes up in only to find himself some simple clothes, a strange tablet conveniently shaped like a Wii U gamepad, and after a few steps, the way out of that place and into the same overworld as in the first section of our demo, without any of the previous markings on the map and with none of the equipment he had before. We catch a glimpse of a hooded figure beckoning to Link, who tells him about the mysteries surrounding the land after a sickness named after series’ villain Ganon ravaged Hyrule centuries ago. Sadly, the demo ended soon after that encounter, so that’s as far as I got before having to shuffle off to my next appointment at the show. Still, the 45 minutes that I spent with Zelda was enough to color me extremely impressed by the sheer potential that the game has to be the most radical departure for the franchise. There’s still much, much more to find out about the game, and considering this is only a chunk of a larger world, which is very sizable already, we’ll have to look forward to discovering once Breath of the Wild comes out in 2017.